I’m beginning a new tradition here at the Imagery; once in a while, I’d like to present some interesting bit of research or trivia to you. Today, I’ll share the top authors who were published most by the two major arms of the Macy Companies and their successors. I will separate the two presses at first, and then merge the results to see who wins the coveted (imaginary) “Most Popular” status! 1) William Shakespeare, with 41 individual releases! I’m counting each book in the LEC Shakespeare as its own entity. 2) Mark Twain, with 12 individual releases. 3) Charles Dickens, with 9 individual releases. 3) Robert Louis Stevenson, with 9 individual releases. 5) Fyodor Dostoevsky, with 8 individual releases. 5) Alexandre Dumas, with 8 individual releases. 5) Joseph Conrad, with 8 individual releases. 8) James Fenimore Cooper, with 6 individual releases. 8) Nathanial Hawthorne, with 6 individual releases. 10) Gustave Flaubert, with 5 individual releases. 10) Leo Tolstoy, with 5 individual releases. 10) Oscar Wilde, with 5 individual releases. 10) Anatole France, with 5 individual releases. 10) Victor Hugo, with 5 individual releases. 10) Jane Austen, with 5 individual releases. 10) Jules Verne, with 5 individual releases. 10) William Makepeace Thackeray, with 5 individual releases. 10) Sir Walter Scott, with 5 individual releases. 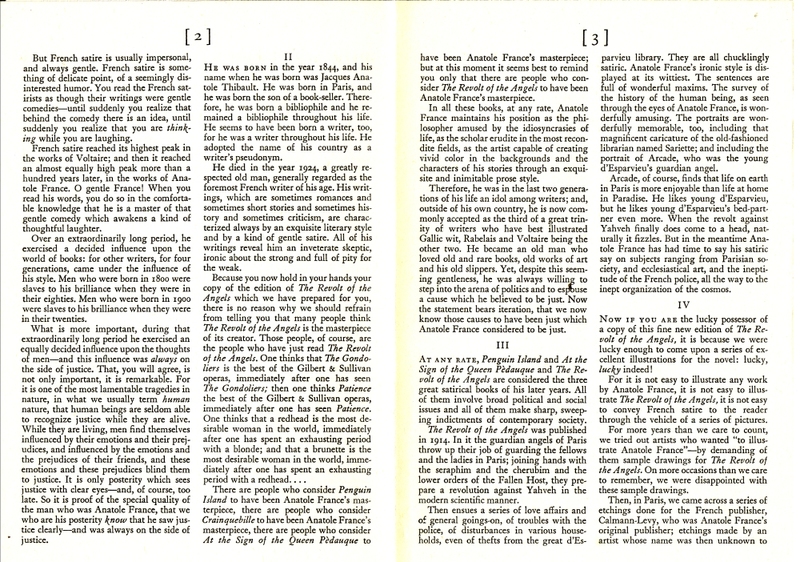 This is not as simple to document, as there remains an incomplete bibliography of the Heritage Press output. But, relying on the research I’ve done here, I’ll do my best. I’ll only be doing a Top 5 due to the less frequent original publications of this Press. 1) Charles Dickens, with 14 individual releases! 2) William Shakespeare, with 5 individual releases. 3) Mark Twain, with 3 individual releases. 4) Anatole France, with 2 individual releases. 5) Henry James, with 2 individual releases. 5) Washington Irving, with 2 individual releases. 5) Charles Lamb, with 2 individual releases. 5) Homer, with 2 individual releases. 5) Nathaniel Hawthorne, with 2 individual releases. 1) William Shakespeare, with 46 books to his name in the canon! 2) Charles Dickens, with 23 books. 3) Mark Twain, with 15 books. 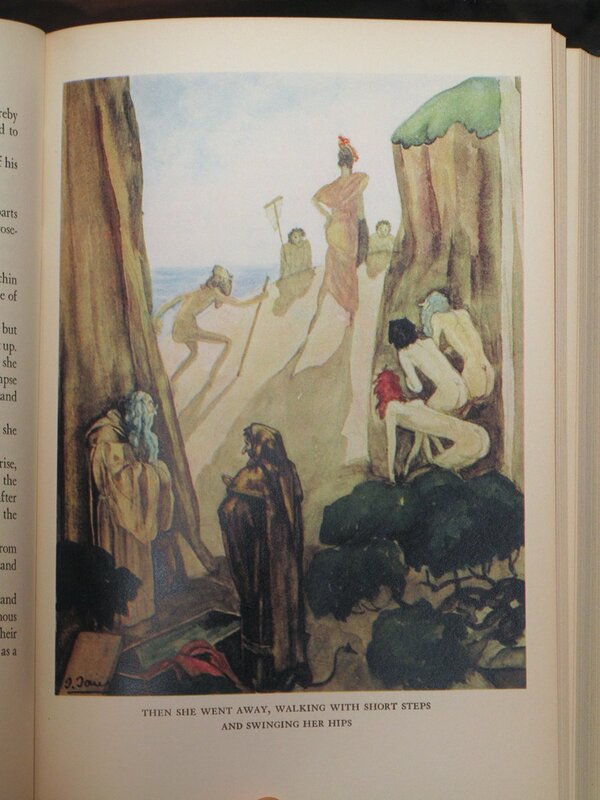 4) Robert Louis Stevenson, with 9 books. 5) Fyodor Dostoevsky, with 9 books (I’m including the Heritage Crime and Punishment as a separate release). 6) Alexandre Dumas, with 8 books. 6) Joseph Conrad, with 8 books. 6) Nathanial Hawthorne, with 8 books. 9) Anatole France, with 7 books. 10) James Fenimore Cooper, with 6 books. 10) Leo Tolstoy, with 6 books. 10) Oscar Wilde, with 6 books. 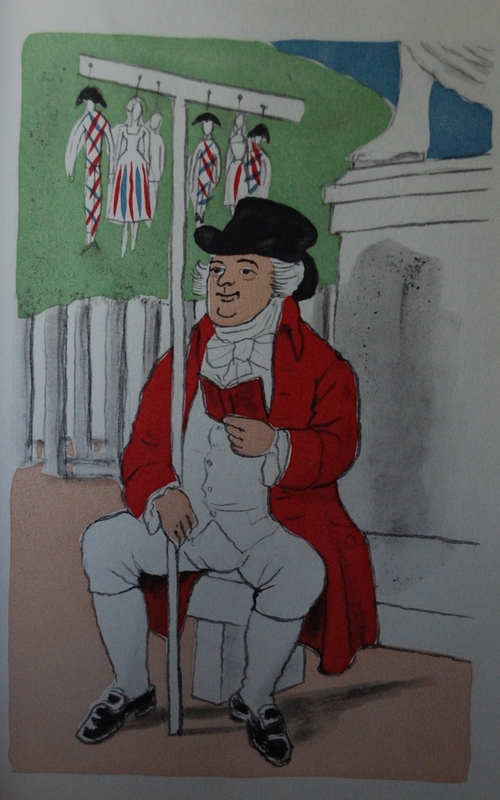 10) William Makepeace Thackeray, with 6 books. This list is subject to change, as there may be a Heritage exclusive somewhere I may have missed. Heritage Press exclusive; part of the Nonesuch Press/Heritage Press Great French Writers collaboration. There is a splendid story behind this series, which I’ve recently separated out into its own post here. 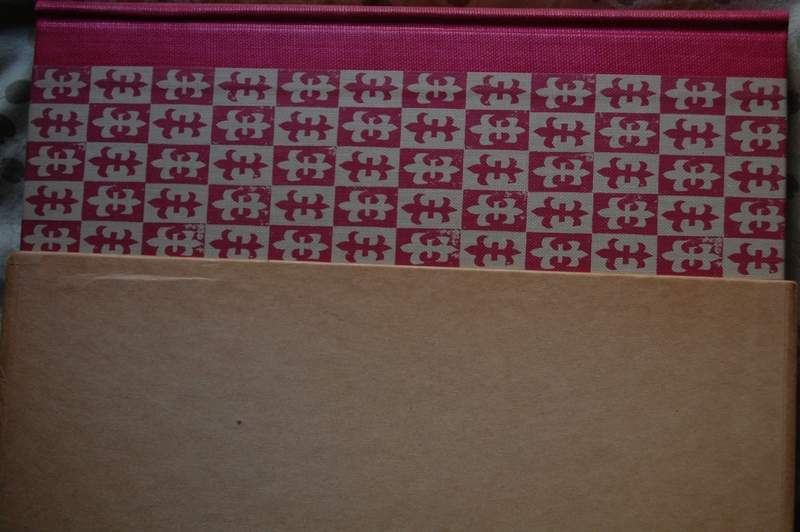 As stated above, the books all share a similar motif for the boards like above; a Fleur-de-lis pattern on both sides, with a gold-stamped spine highlighting the title in a rather fancy font. 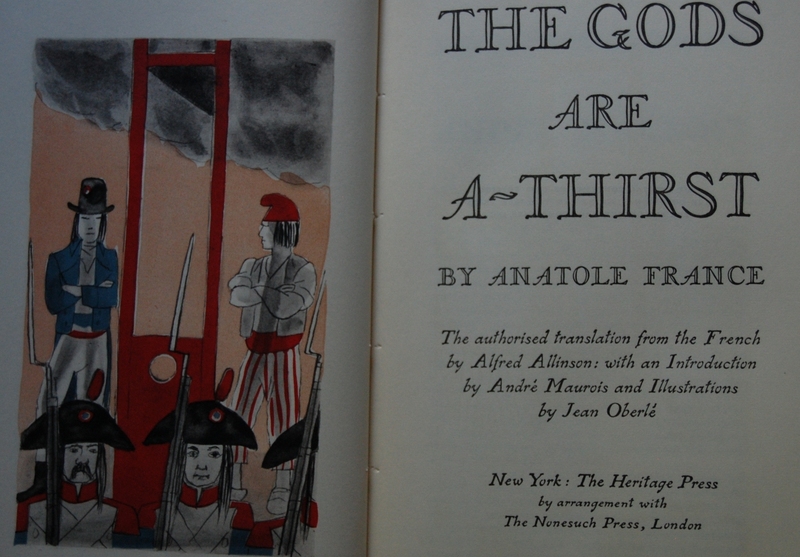 Anatole France once again makes an appearance here; we’re running out of books to spotlight! 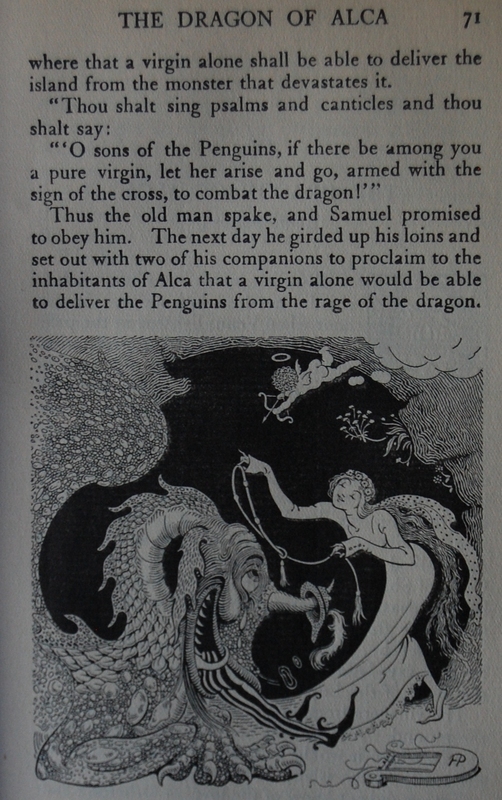 I’ve covered the two editions of Penguin Island and the Heritage Revolt of the Angels already, and, for those who stumble upon this on the main page of the blog, will see that I just shared a heap of illustrations and info from the Dodd, Mead & Co. illustrated editions of those two works right below this one (or for those just glancing at this one post, here’s the link!). 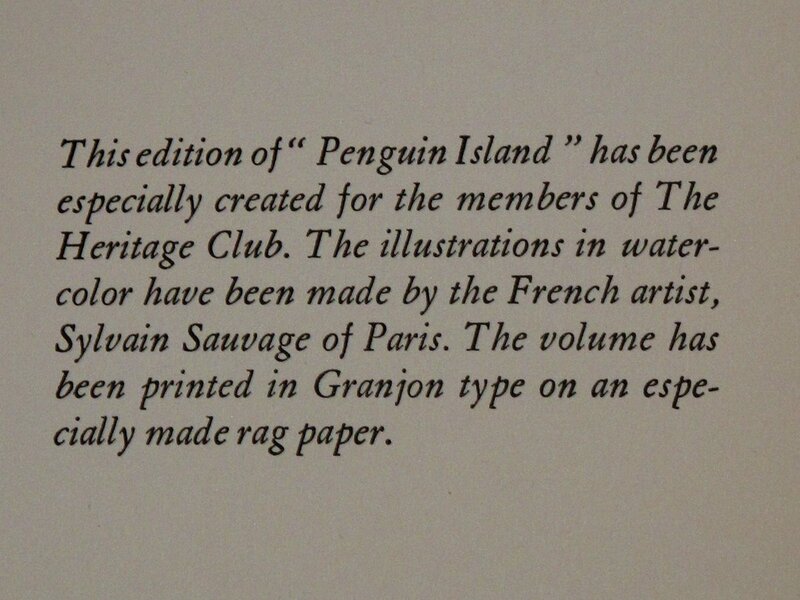 All that’s left is for me to track down the LEC copies of At the Sign of the Queen Pedauque and The Crime of Sylvestre Bonnard , as well as a LEC or Heritage copy of his shorter novel Crainquebille…not to mention the Sauvage Penguin Island from the Heritage Press! I adore this man’s work, that I most certainly do, and he’s very high, if not the highest, on my “need to own all of the works done by Macy of this author” list. Luckily, his relative obscurity in today’s literary circles will make that not too horrid an expenditure. 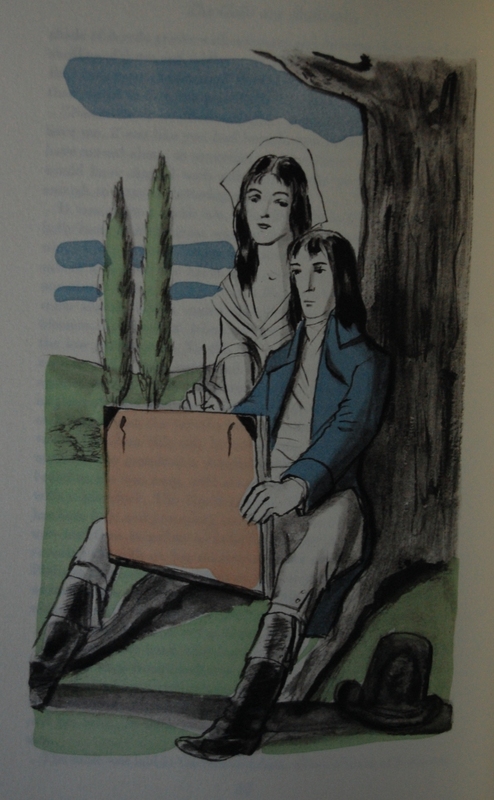 Jean Oberlé makes his sole appearance in the George Macy Company canon here. I’m a little torn by the work, personally; it’s colored well and Oberlé has a knack for bringing out the humorous aspects in his illustrations, but the overall look and layout doesn’t excite me. Such is life, I suppose; I can’t be wooed by everyone! Production details: the font is Cochin, with headings in Sylvan (hmm, almost a nod to Sylvain Sauvage!). 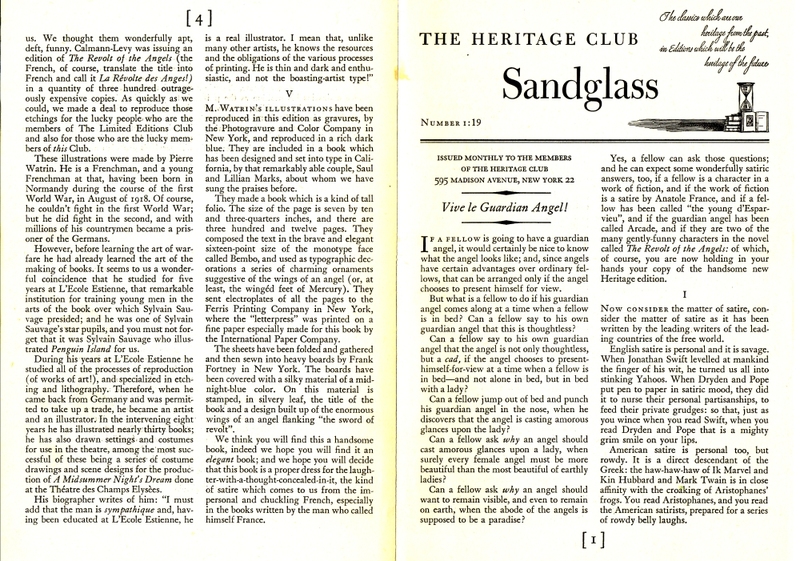 The title on the title page and ornamental letters are all done by hand. 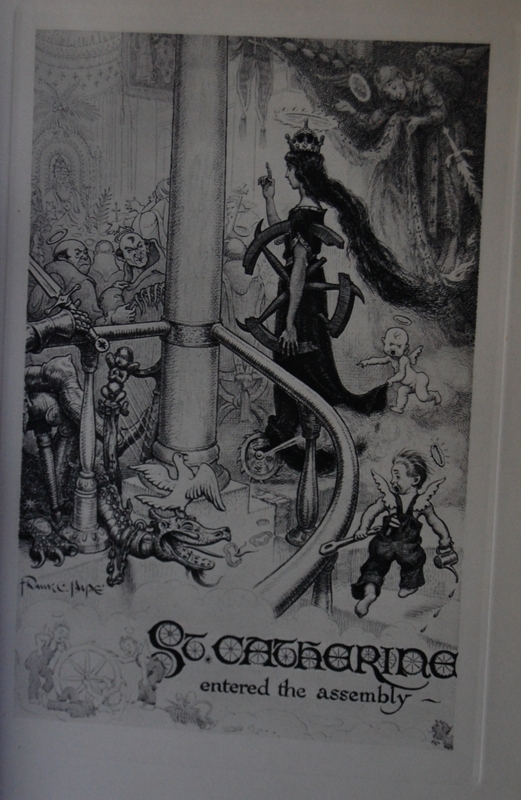 Riverside Press printed the text, while the Photogravure and Color Comoany of New York produced the illustrations. 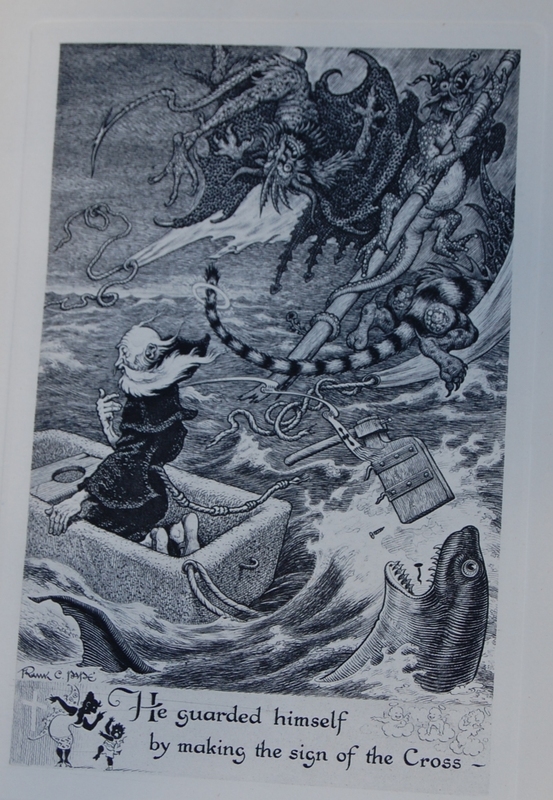 The Arrow Press colored the art via pochoir, which the Sandglass gleefully explains on Page 4. No bindery info this time! 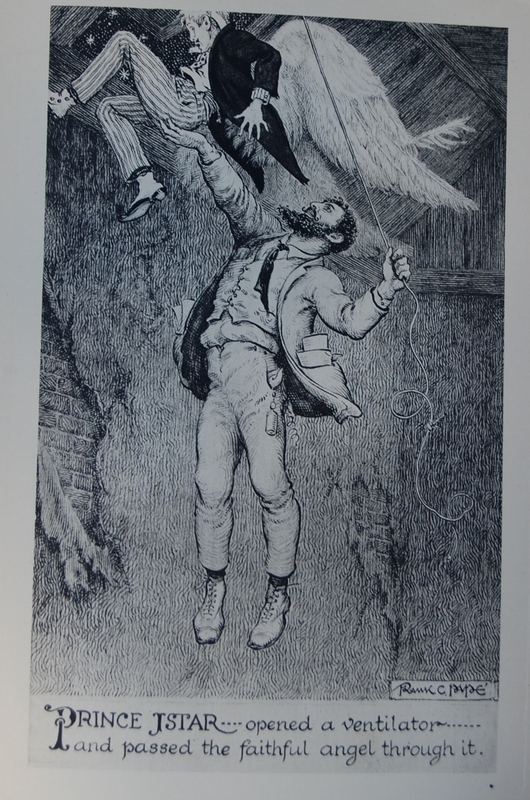 The interpretation of Oberlé’s artwork is radically different in the two works! 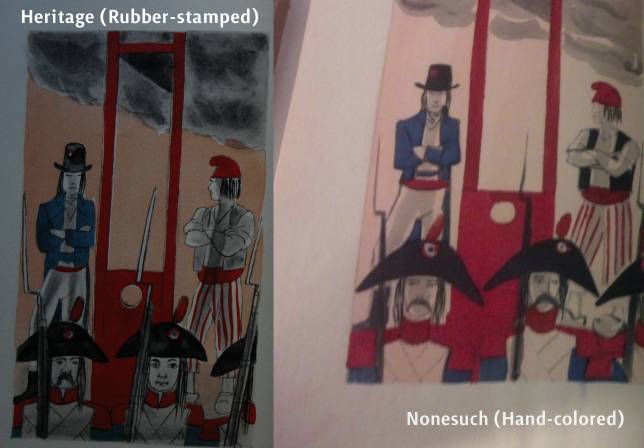 The Nonesuch was hand-colored, as Nick points out, compared to the rubber-stamped prints done for the Heritage printing. Fascinating stuff, and it makes me wonder if other books shared between the two printing houses did the same sort of treatment. Kudos again, Nick! Personal Notes – I bought this from Old Capitol Books in Monterey the first time I visited the rechristened Bookhaven. It’s not the first printing, but I’m happy to have another France tome in my collection. It’s in really good shape. 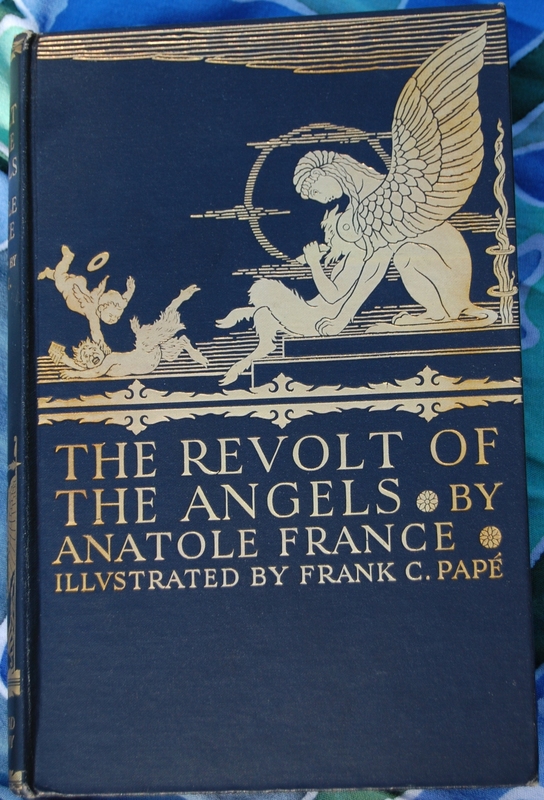 Of Interest: Anatole France’s The Revolt of the Angels and Penguin Island, as published by Dodd, Mead & Co.
July 10, 2013 Comments Off on Of Interest: Anatole France’s The Revolt of the Angels and Penguin Island, as published by Dodd, Mead & Co. Welcome to the very first non-Macy book post here at the George Macy Imagery. 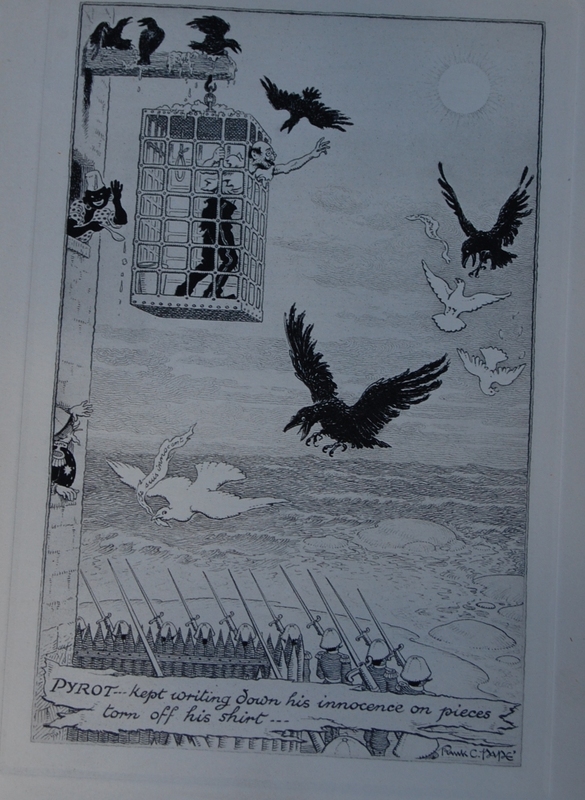 Today’s post will focus on the lovely editions of The Revolt of the Angels and Penguin Island Dodd, Mead and Company put out in the early 1900’s. I’ve ordered a slew of other titles in the line from my local library system for examination, as I do adore these two volumes immensely. 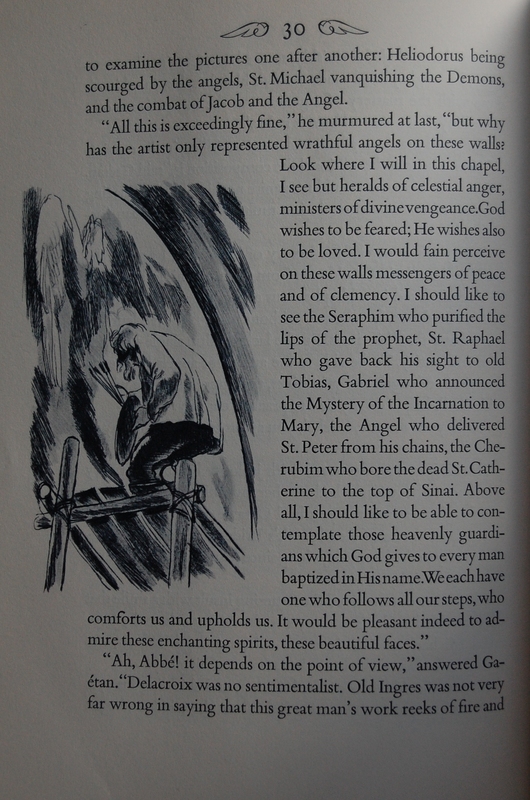 What really makes them remarkable is the artwork done by Frank C. Papé; best known perhaps for his work on James Branch Cabell’s works like Jurgen. He didn’t handle all of Dodd, Mead’s France collection, but he probably should of, given how amazing these two are. I’m abandoning the usual format for these special posts, but I’ll inform you on what I do know in the paragraphs. 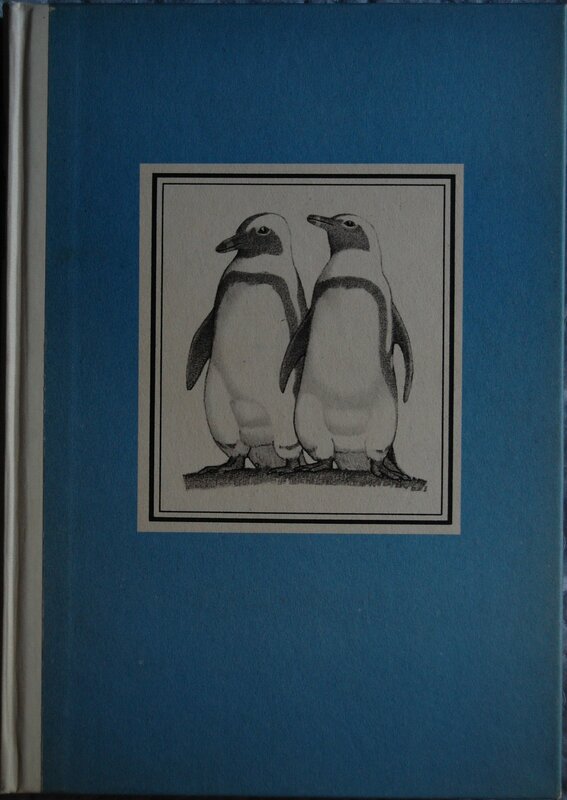 Front Binding – Let’s start with Penguin Island. 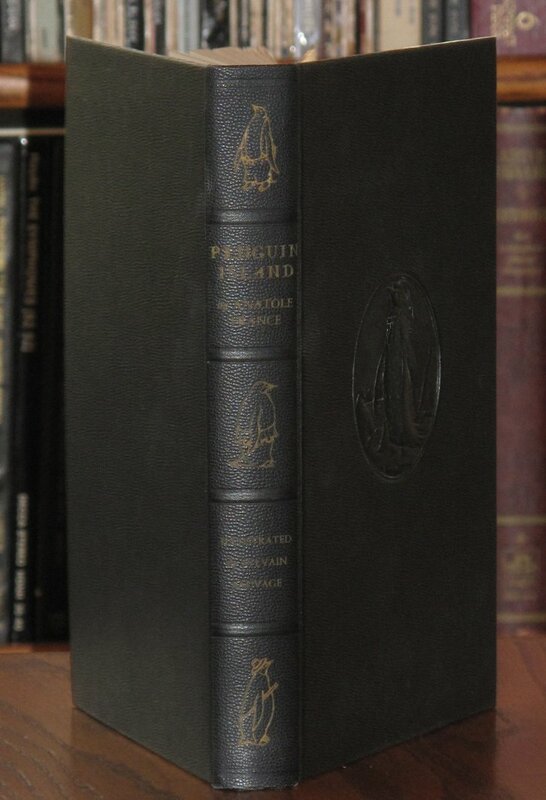 This edition was published in 1926 by William Clowes and Sons, Limited, located in London. A.W. Evans is the translator; the very same as the LEC/HP Cameron and HP Sauvage editions. 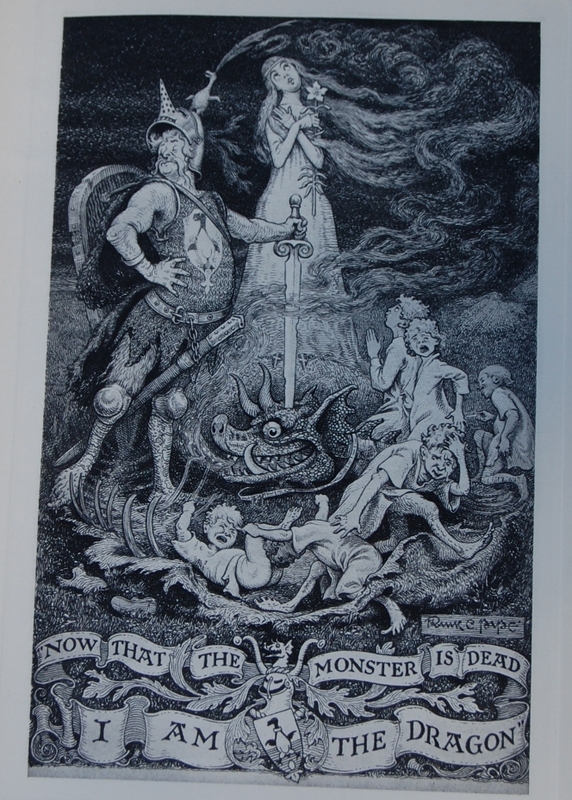 This series was edited by Frederic Chapman and James Lewis May, featured 31 volumes, and were issued in Great Britain by The Bodley Head. That’s all the production details I can share. The bindings are striking; I’ve seen a couple of the volumes are red cloth over black, but I’ll update this when I get a hold of the library copies of the other works. This one ended up in my hands courtesy of Carpe Diem Rare Books in Monterey for $15. It’s in fairly good shape considering that it’s close to 90 years old! 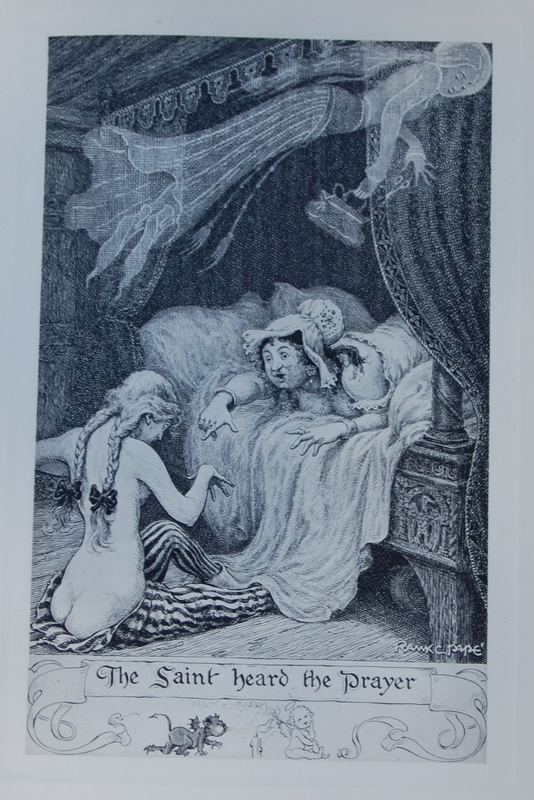 Title Page – Here’s Papé’s whimsical artwork on full display. He was a master, no question, and his work is perfectly suited for both this book and Revolt. 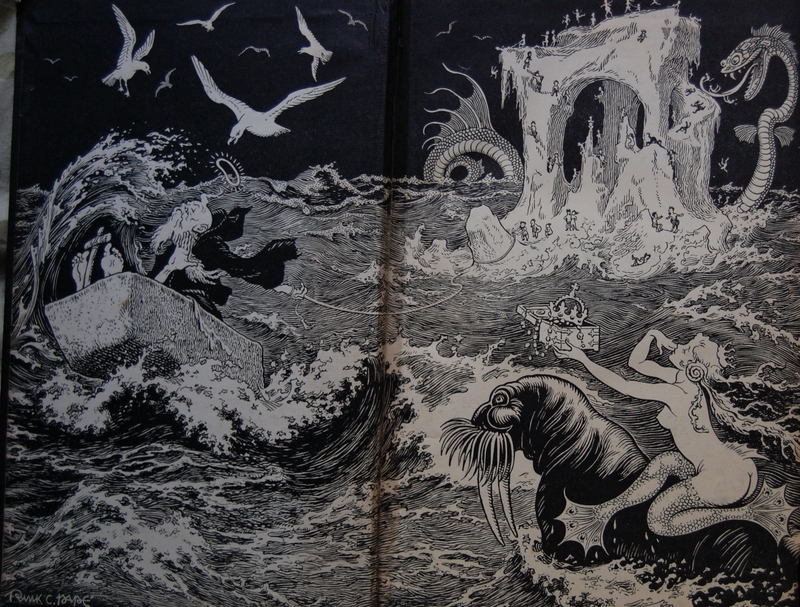 Front Endpapers – Incredible. That’s just the best way to describe Pape’s beautiful art. Page 2 – There’s many smaller illustrations throughout both books; I’ve focused on the bigger ones, but there’s a couple of examples in both galleries. 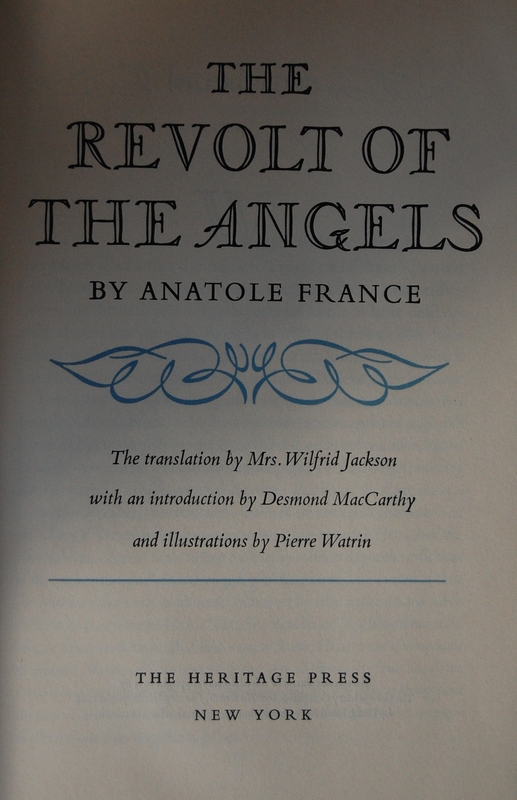 Front Binding – Revolt features the translation work of Mrs. Wilfrid Jackson, just like Macy’s LEC/HP edition. 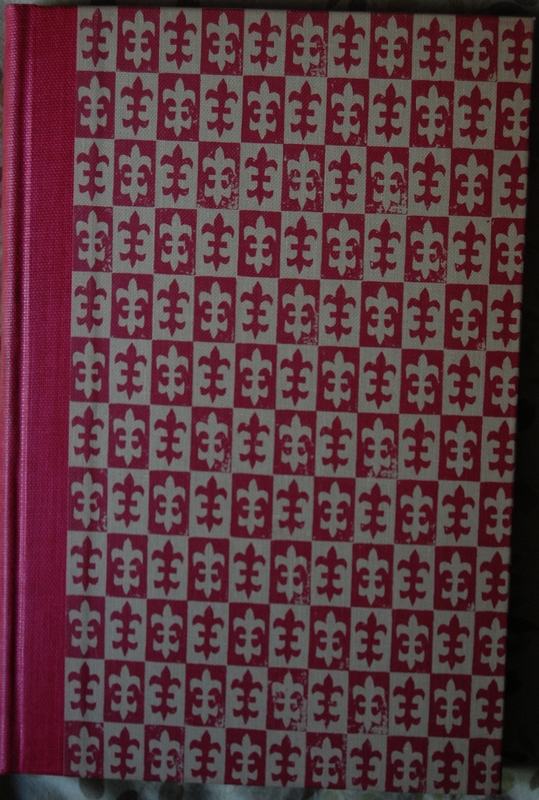 This one was issued in 1928, printed by Richard Clay and Sons, Limited, in Bungay, Suffolk. Bernard Miall joined the editorial board by this point. I adore both of these works by France, and this one is just…wow. Seriously. The cover has a little bit of discoloration to the gold leaf on the big wing of the sphinx, but otherwise it’s in very good shape. I got this as a gift a few years ago. 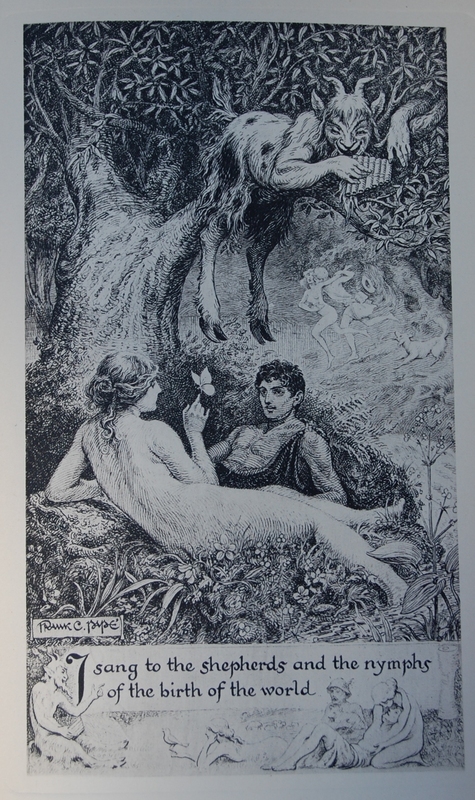 Title Page – More good stuff from Papé. 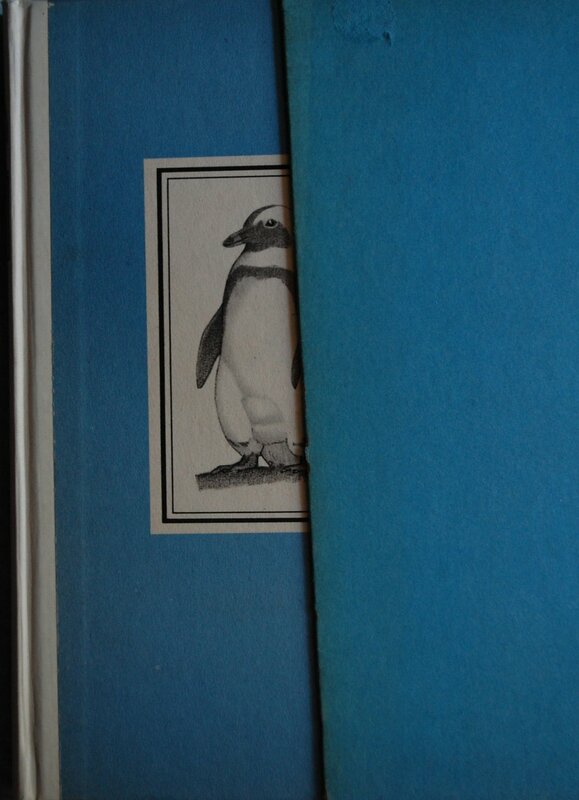 Front Endpapers – Not quite as astounding as Penguin Island’s, but quite apropos to the plot. Page 78 – I love this one. Page 278 – This is so intense. Love it. All and all, wonderful printings of a too-little-read author nowadays. If you like France’s work, consider adding these lovely books to your collection. If you haven’t read France, these are both fantastic stories! Binding and Spine – Anatole France received quite a smattering of attention from the George Macy Company, way more than he receives today (a shame!). 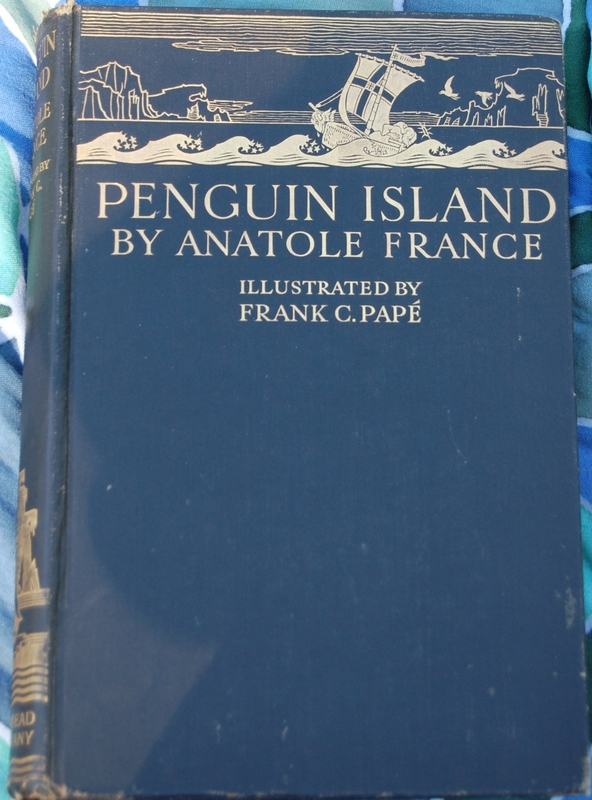 Penguin Island was the one work of France’s that Macy produced twice. 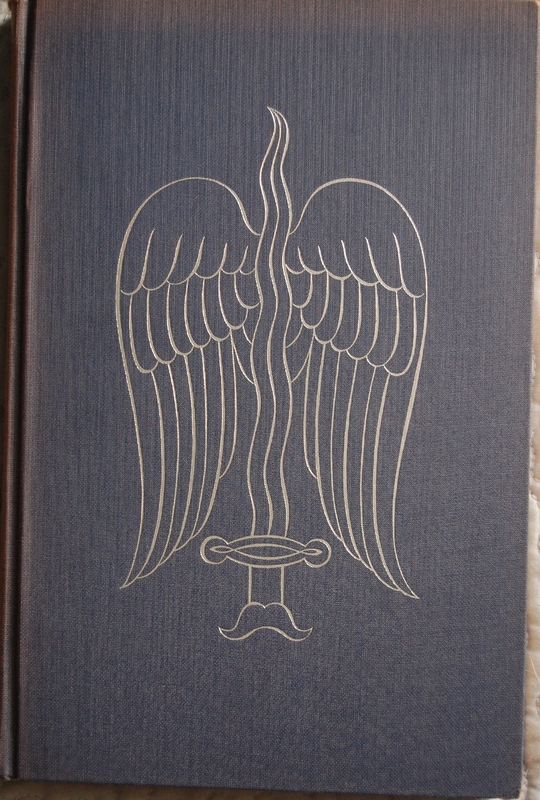 I discuss France’s LEC and Heritage editions in my earlier Revolt of the Angels post. 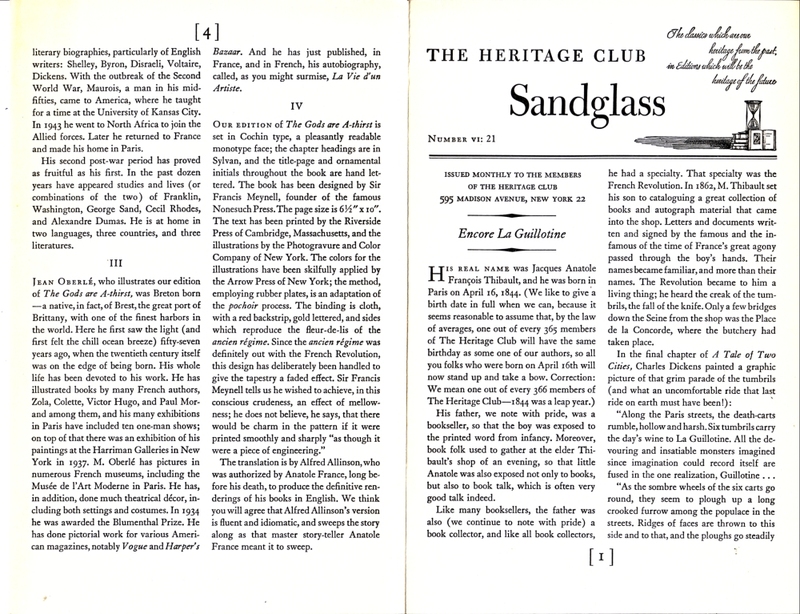 Type: Granjon was chosen for being both dignified and unobtrusive – (Sandglass: “dignity is required in the setting of a satiric novel”) – and its size is 14 pt. The paper, made by the Worthy Paper Company, resembles the paper used for the HP Romeo and Juliet and is guaranteed to last for at least two centuries! 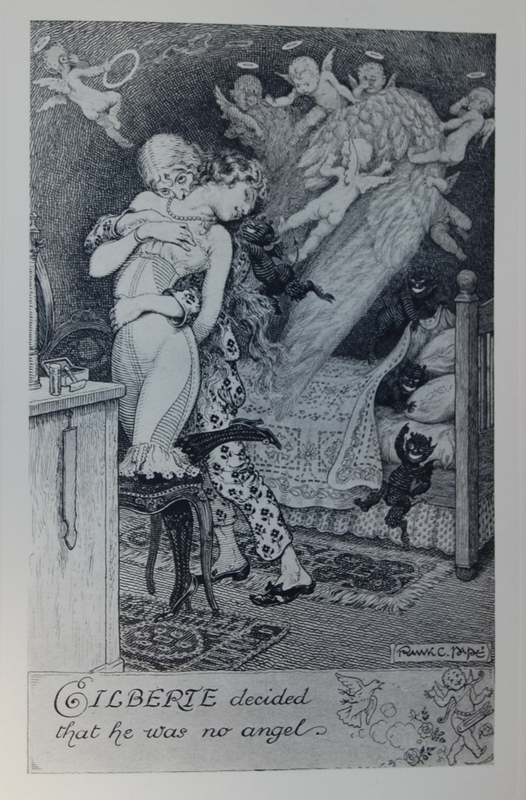 Illustrations: Ten full-page water-colour pictures, reproduced to the exact size of Sauvage’s original paintings by Ralph M. Duenewald of New York, who was also responsible for printing Sauvage’s illustrations for the LEC Cyrano and Crime of Sylvestre Bonnard. 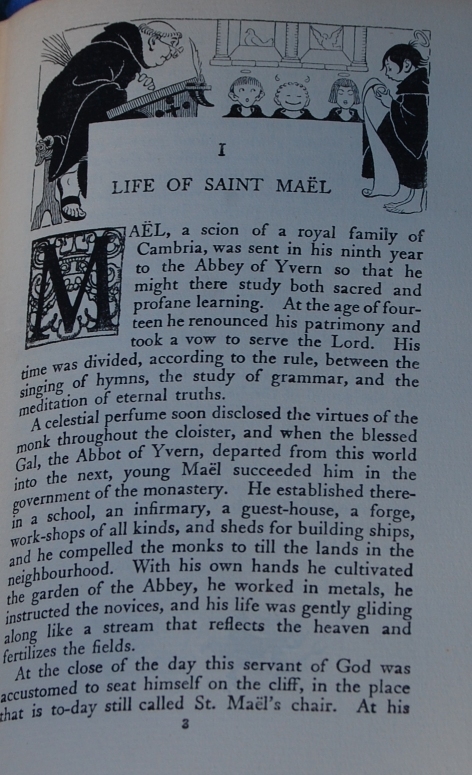 BTW, “The navigation of Saint Mael” is on page 34, and “Then she went away…” on page 60. 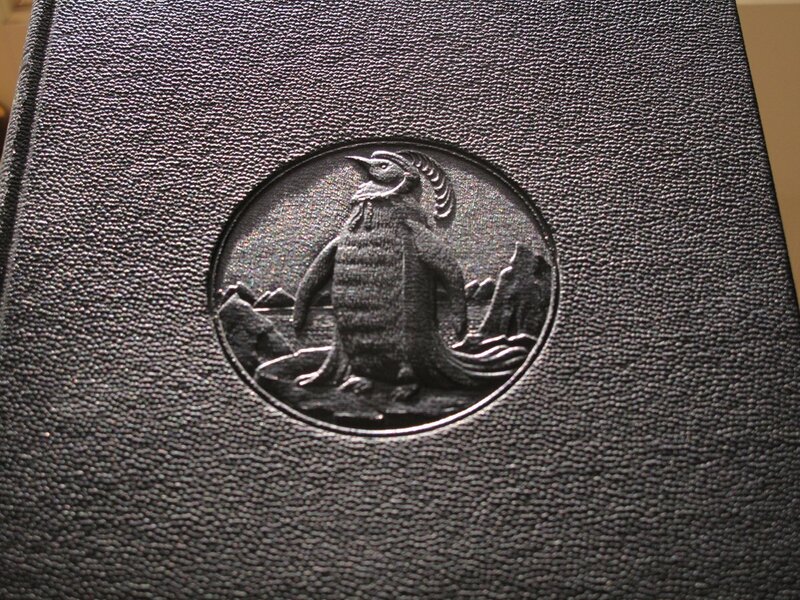 One of the most interesting features of the book is its binding. First the bad news: it’s not leather. In the words of the Sandglass, the sheets are encased in “heavy boards over which the binder has worked a material from the factories of E.I Du Pont de Nemours Company. It is a material of which the surface is treated with pyroxolin. It will last longer than most book cloths, far longer than most cheap leathers, not quite so long as expensive leathers that are used in the binding of a hundred dollar books. That’s all I can give you for now, but I’ll refresh this post when I find out more. Title Page – A.W. 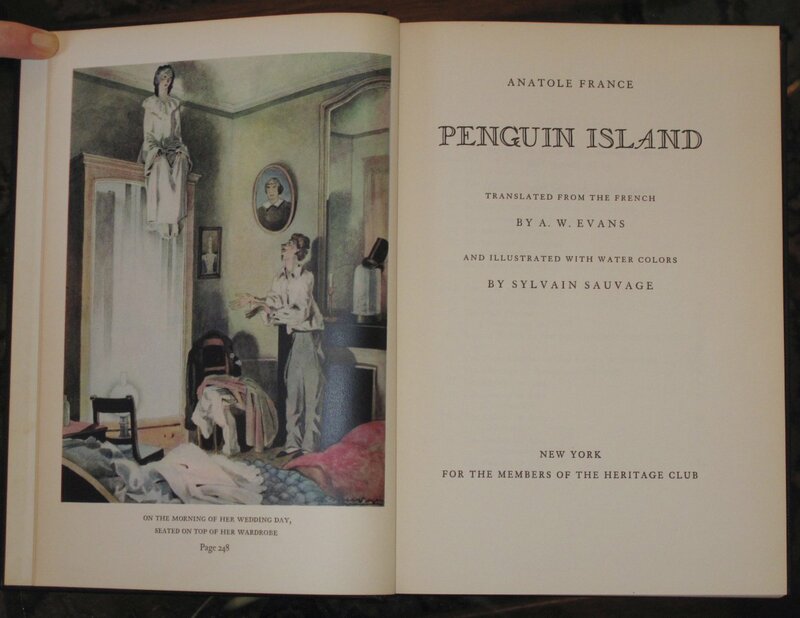 Evans was the translator for Penguin Island, and there is no introduction whatsoever. Sauvage’s art is a great fit from what I can tell. 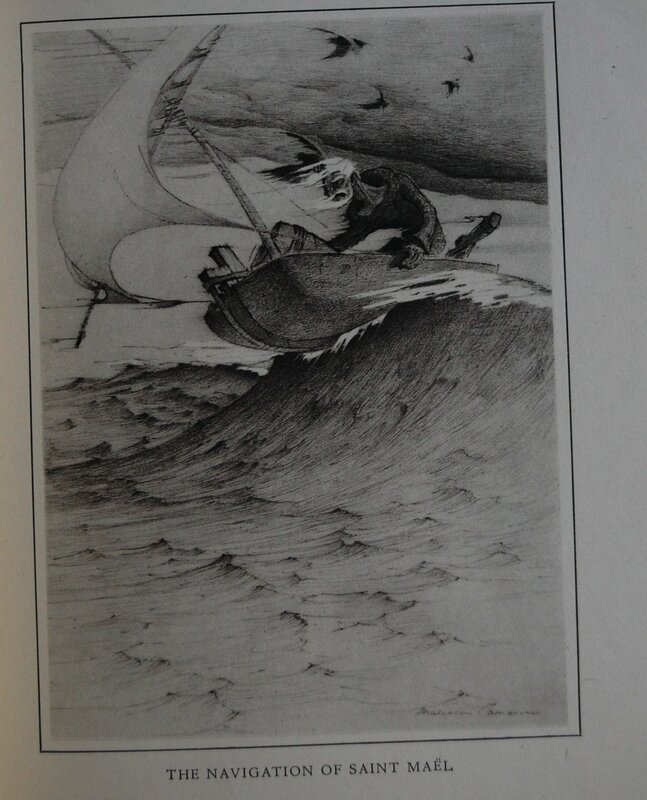 Chapter IV – As I do not own this, I do not know the specific page numbers. I’ll update this once I know. This is incredible art, that it is. Example Illustration – More mastery. I think I need this. Extra special thanks to Django6924 for the images and featherwate for the info from Bussacco! 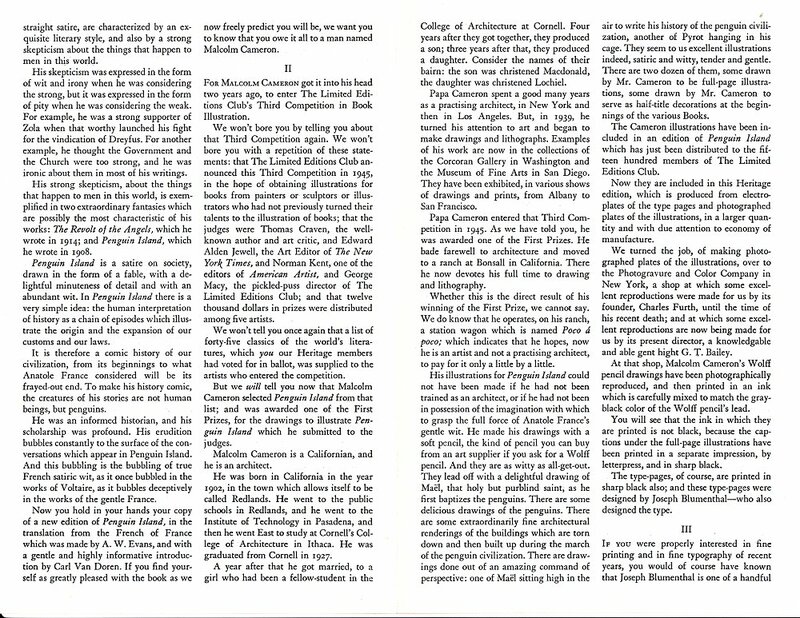 Reprint of LEC #181, 17th Series, V. 7 in 1947. Born in Redlands, CA on Sept. 2, 1902, Attended the California Institute of Technology and Cornell University. He apprenticed in an architectural office in NYC in 1927-28 and then moved to Los Angeles. In 1945 he settled in Bonsall, CA and lived there until moving to Shaw Island, WA in 1962. He died there in March 8, 1975. 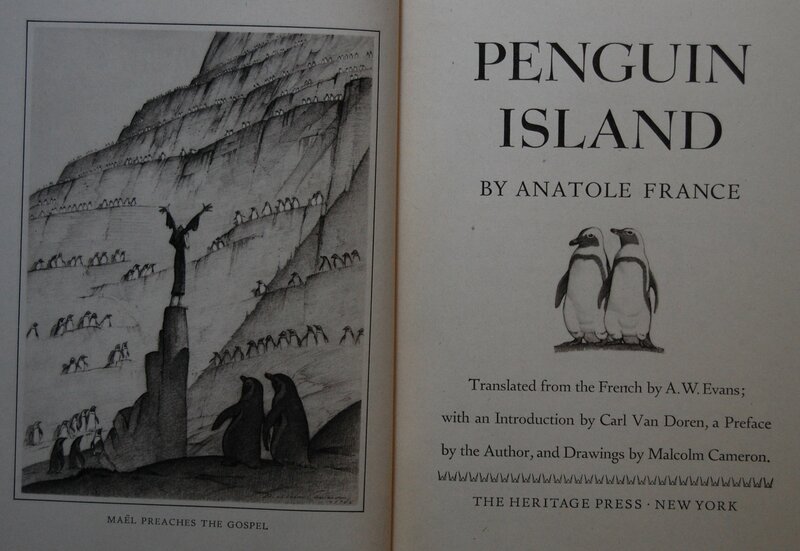 Illustrated books such as “Penguin Island” by Anatole France and “Notre Dame de Paris” by Victor Hugo. 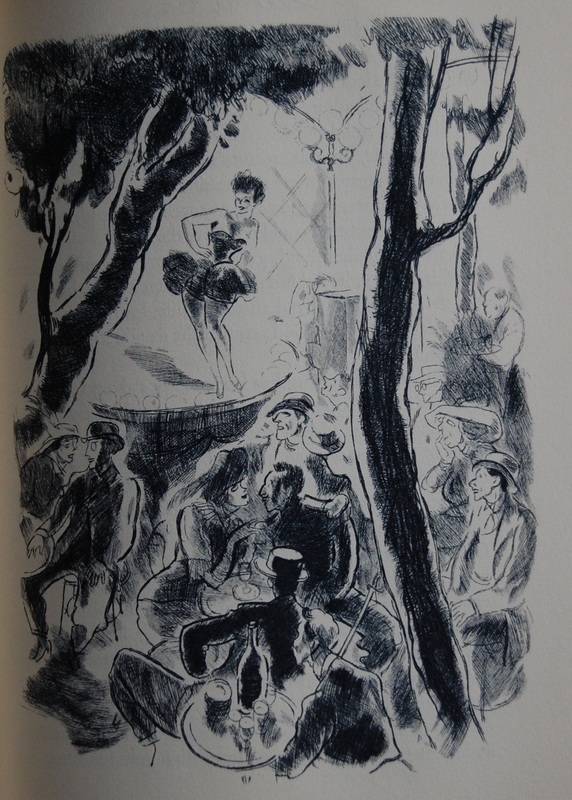 Exhibitions: Oakland Art Gallery, 1939; GGIE*, 1940. In: Library of Congress. Some production details, then. 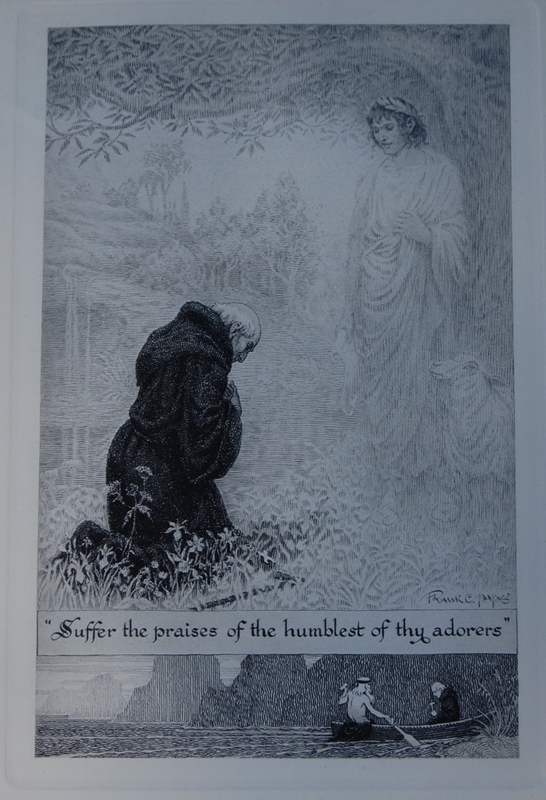 France’s text and Cameron’s drawings were reproduced through electroplates and photographs, respectively. The Photogravure and Color Company handled Cameron’s side of the equation. 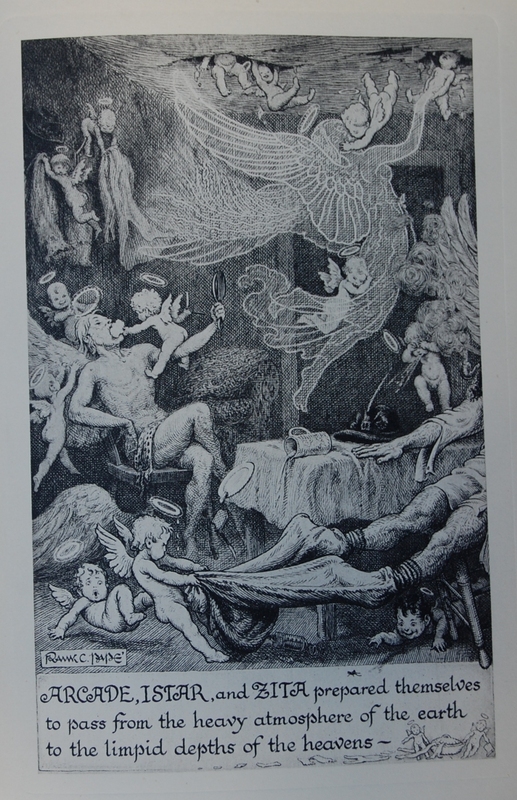 Joseph Blumenthal was the designer of this edition, who also had personally designed the font chosen for the work, Emerson. It is called that due to Blumenthal’s choice to use it to print Ralph Waldo Emerson’s Essay on Nature. Designer buffs will want to peruse this Sandglass, as it goes into Mr. Blumenthal’s career in very extensive depth. The Stratford Press handled the printing of the text. The bindery is suspiciously absent. Title Page – A.W. 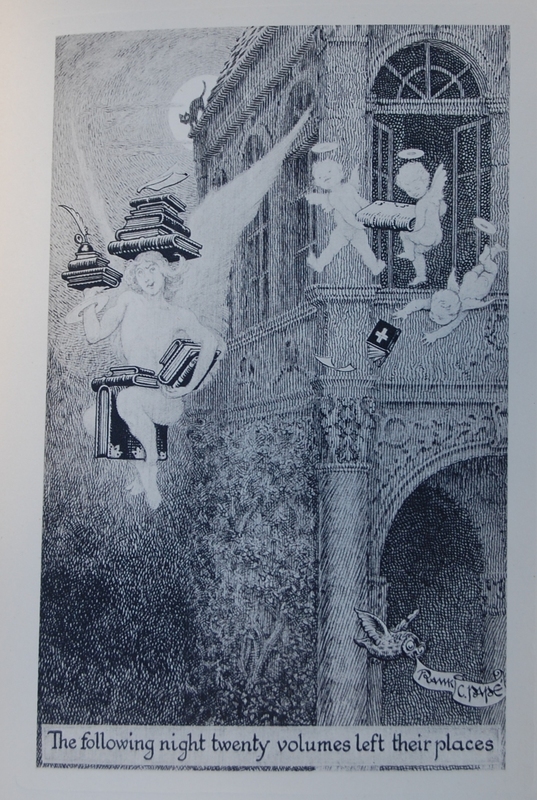 Evans’ translation made the leap from the Sauvage edition. Carl Van Doren supplies this printing with an Introduction. 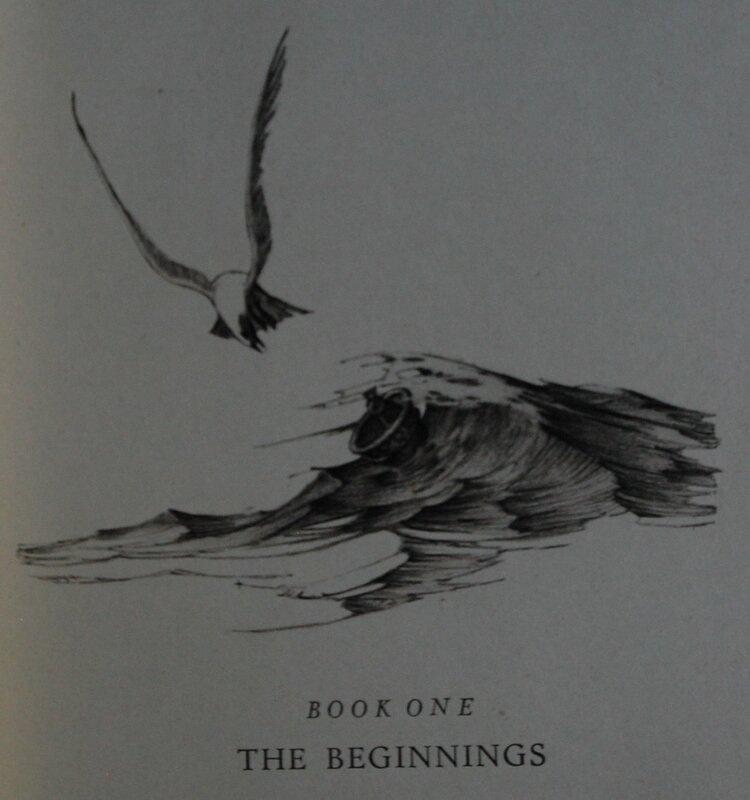 A lovely title page, this one. I like it more than the Sauvage edition. Page 30 – Cameron’s linework is exquisite. 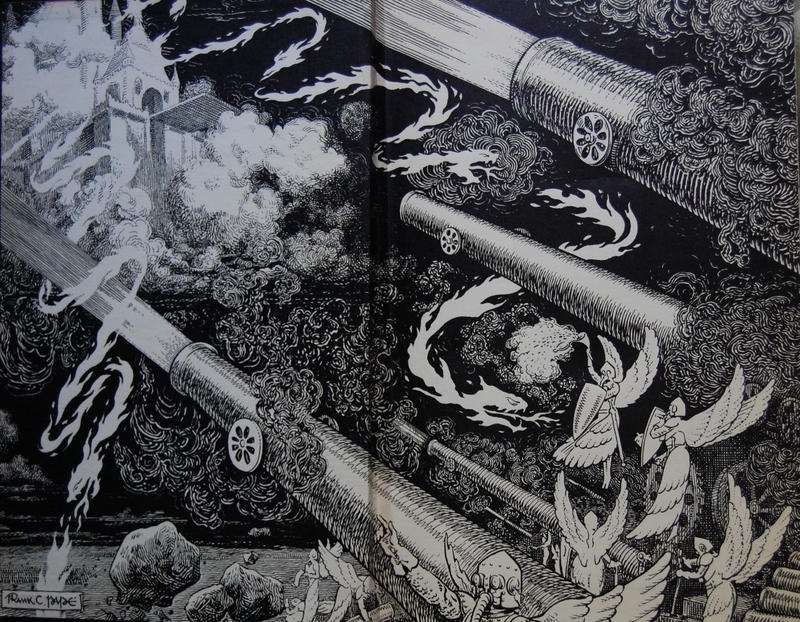 France is doubly lucky to have two fine illustrators render his work so delightfully for one publishing house. Personal Notes – I got this at Bookbuyers in Monterey as part of a trade-in, and I’m really happy to have it. I adored Revolt of the Angels, and I hope I will enjoy this as well. 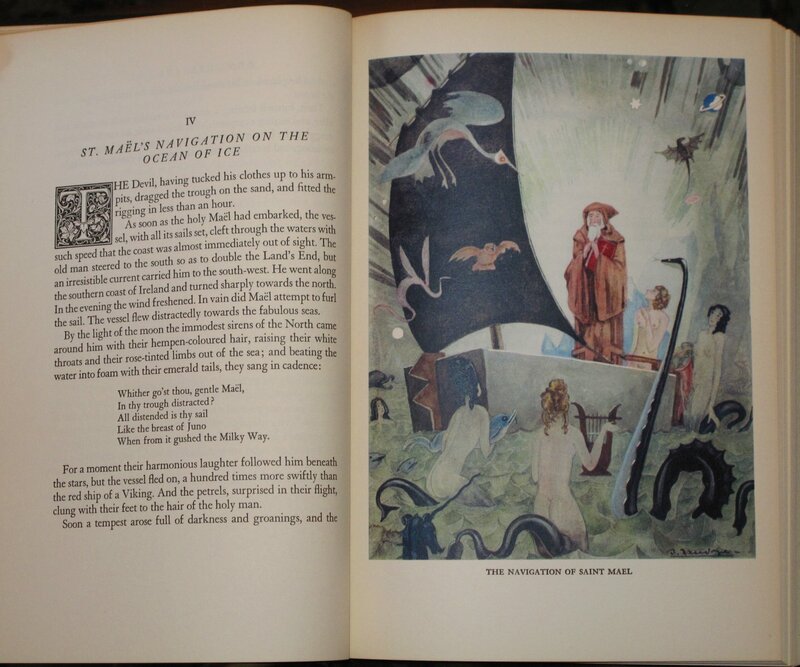 I’d like to own Sauvage’s edition as well, which would give me three versions of this work (I also have an early Dodd, Mead edition with Frank C. Pape’s artwork, and that is also exquisite!). 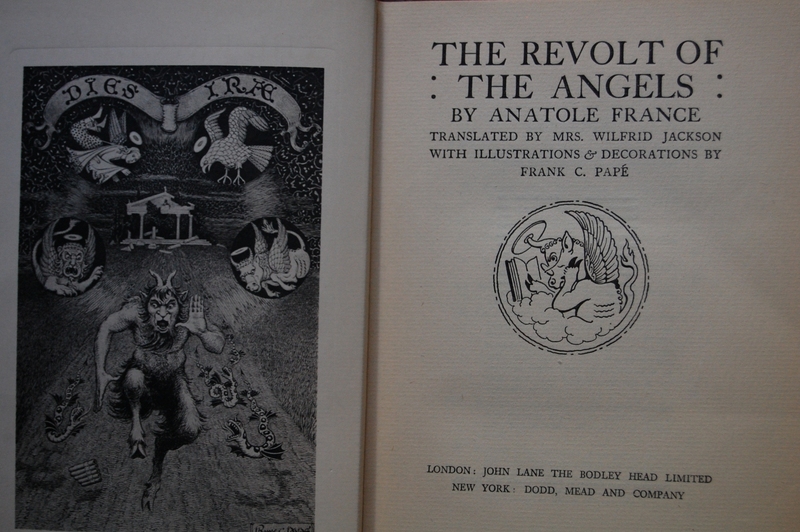 The Revolt of the Angels was another production from Saul and Lillian Mark’s Plantin Press in Los Angeles, and the Macys shared HuxleyTheCat’s opinion about their designing and producing skills. In the Monthly Letter on another of the several books from Plantin, Macy wrote that the presswork “was the finest since John Henry Nash went to his reward.” This was the ultimate in praise, as Macy felt that for quality, Nash was unmatched by any printer alive. HuxleytheCat is a fellow user on LibraryThing, FYI. But here we are still on the binding and I’m prattling on and on. Let’s talk about this! The boards are covered in a “silky material of a midnight-blue color” according to the Sandglass, with a sword adorned with angel wings stamped into the front boards in silver leaf. This blue is a lovely color, but the ink that stained it is incredibly sensitive to fading in the sun, as I’ve seen at least five different copies all afflicted with a grayed, dull spine. Shame, too, as it’s otherwise a nice book. Title Page – Mrs. Wilfrid Jackson, who spent much of her time translating the works of France it would seem from a quick Googling, seems the right person for the job translating this work. Desmond MacCarthy serves up an Introduction. 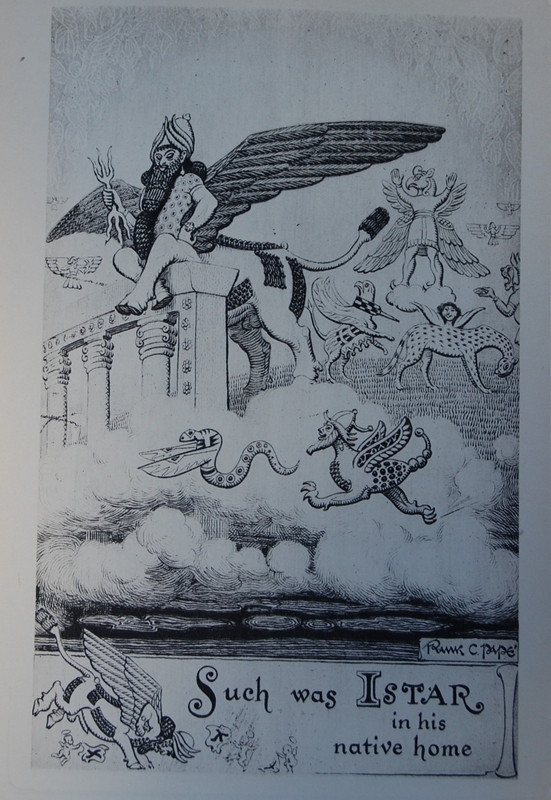 The book was printed by the Ferris Printing Company in New York, on paper specially made for the Heritage Press by the International Paper Company, which were then bound by Frank Fortney, also of New York. 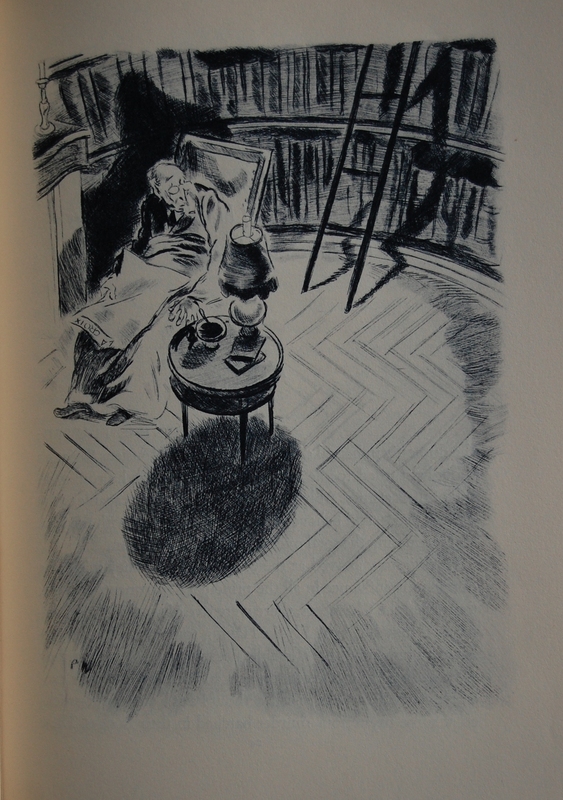 What the Sandglass doesn’t reveal is that during the seven years that elapsed between Watrin’s etchings appearing in the Calmann-Levy limited edition of the Revolt (1946) and their re-appearance in the LEC/HP editions of 1953, the artist himself seems to have largely abandoned serious book illustration to become an animation artist (and later director). He worked on one of the most famous of French cartoon features, Le Roi et L’Oiseau [English title: The King and the Mocking Bird], which began production in 1948 and was finally completed in – wait for it! – 1980; the delay was caused by studio bankruptcy and arguments over rights. The best-known of his other films is The Twelve Tasks of Asterix (1976), which he co-directed with Asterix’s creators Goscinny and Uderzo. 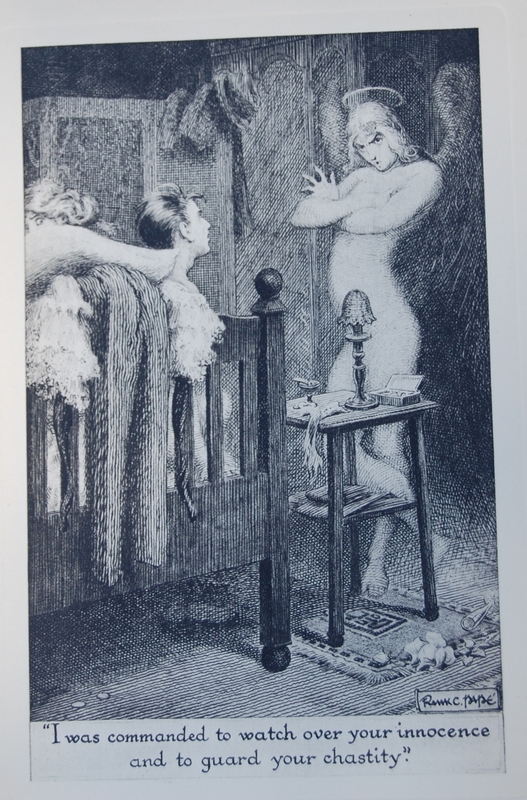 It was an interesting change of career for someone who was a star pupil of Sylvain Sauvage and according to the Sandglass had in only eight years established a high reputation as an illustrator and theatre designer. I have to say that most of the few illustrations of his I have found reproduced on the internet are pretty mundane compared to his etchings for Revolt: bread-and-butter pictures in children’s books and strip-cartoon histories of various French provinces (and let’s not overlook Space Mission Health Hygéa 7, a bizarre-sounding medical guide for teenagers[?] issued by the French government). At http://www.flickr.com/photos/62235807@N02/ I’ve posted a still from Le Roi; the film is in colour but this b&w portrait hanging on a wall seems to have the same graphic wit as Watrin’s etchings for Revolt. I like to think of it as his work. And I’m sure that’s more than you ever wanted to know about the life and work of Pierre Watrin! Perhaps more than I wanted to know, but am happy to now know! Thanks! 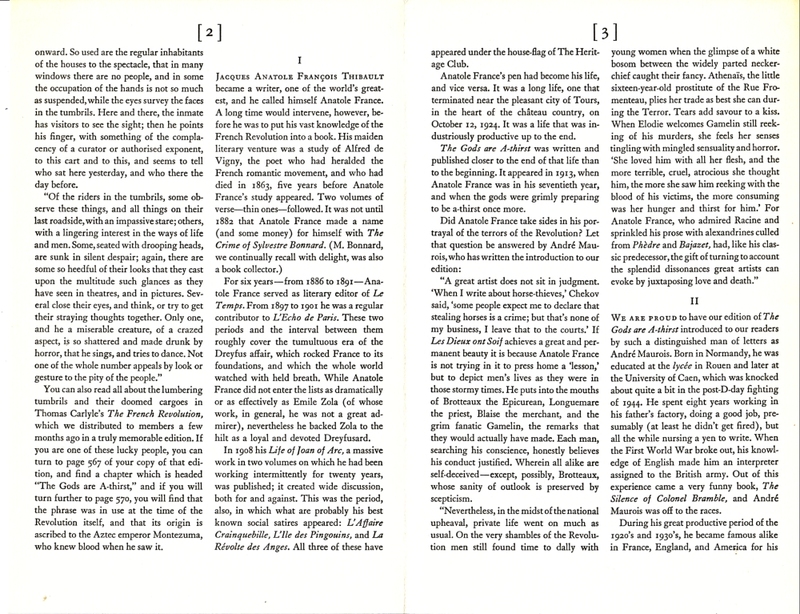 Page 30 – There’s some in-text art as well. 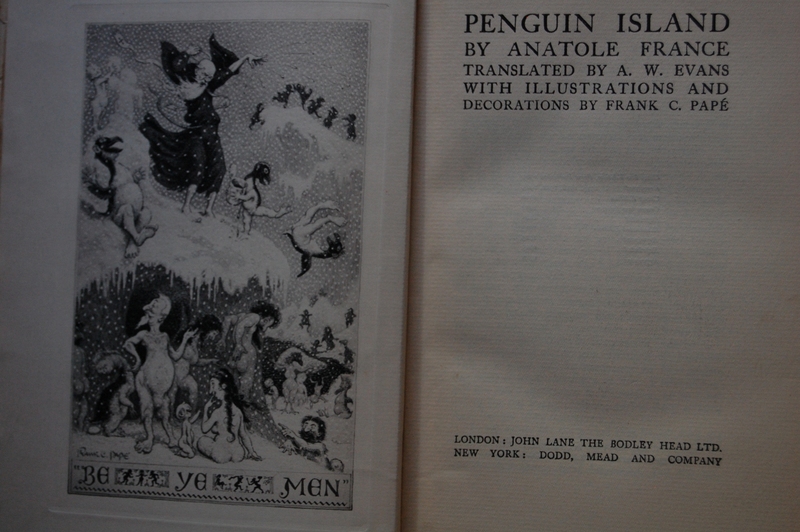 I also happen to have a delightful Penguin Island printing by Dodd, Mead in the late 1920’s that is illustrated wonderfully by Frank C. Pape. 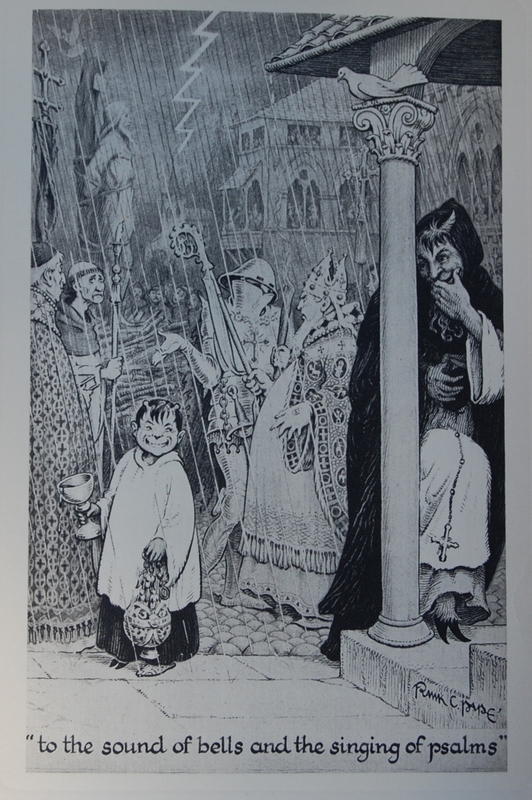 He did a series of France’s work for that publisher following France’s Nobel Prize win. Unfortunately, Pape never collaborated with the George Macy Company, but you can take a look at the Dodd, Mead Revolt here, if you’d like to compare. Another interesting thing that happened with this book for me is the inclusion of a second Sandglass, for the Heritage Alice’s Adventures in Wonderland by Lewis Carroll, a book I have never laid eyes on (and not for lack of trying!). It is some relief to know that if I ever do stumble upon one I won’t need it to have a Sandglass inside it as a determining factor (although I’d probably buy it on the spot considering how scarce it is). 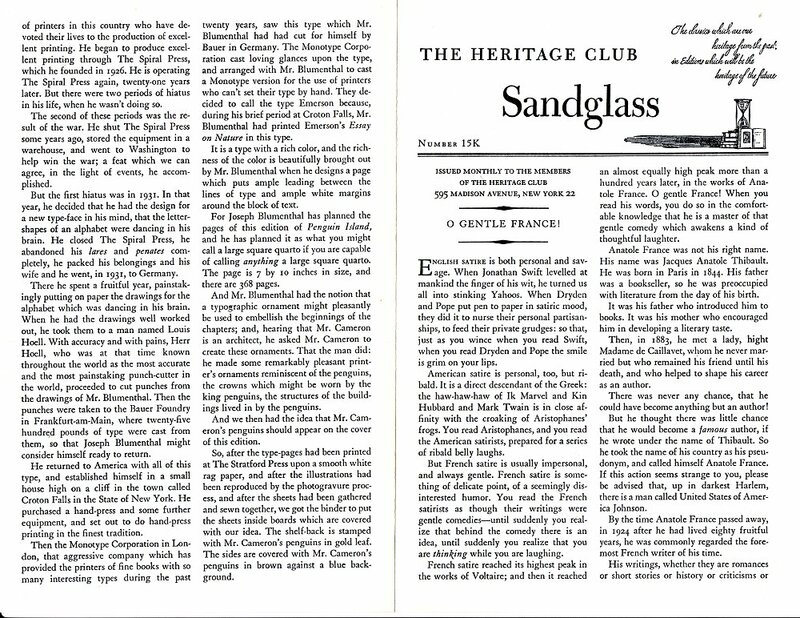 Curiously, the second copy I bought had a Sandglass for Washington Irving’s History of New York if I remember correctly. So, look inside copies of Revolt for unexpected Sandglasses! You are currently browsing entries tagged with Anatole France at The George Macy Imagery.